Phyllis Omido, is a Kenyan grassroots environmental activist and co- founder of the center for justice governance and environmental action an organization that advocates for the environment and socioeconomic rights of marginalized and ignored communities around extractive industries in the coastal belt of Kenya. She was Africa’s recipient of the Goldman Environmental Prize in 2015 and is known for organizing protests and shutting down a lead smelting plant located in the middle of Owino Uhuru, a slum near Mombasa. The plant was causing lead poisoning by raising the lead content in the environment, killing residents, in particular children, and harming others, including her own child. Center for Justice Governance and Environmental Action(CJGEA)- Kenya is the 2015 Africa Recipient of the Goldman Environmental Prize Dubbed “The Green Nobel” Under Miss Phyllis Omido the recipient. Our focus is on mainstreaming human rights based approach to environmental protection of marginalized and ignored communities around extractive industries. 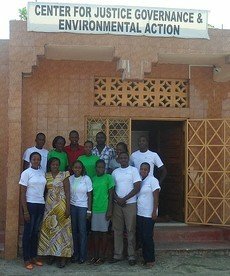 CJGEA is an environmental/human rights community based organization located in Kilifi Kenya working for the realization of human and environmental rights of the economically marginalized and ignored communities in the coastal region of Kenya. CJGEA is a registered Non-Profit Non-governmental community based organization. The challenges being faced by the marginalized communities led to the need to address socio-economic rights, policy change and environmental governance issues. CJGEA’s operations are guided by its constitution and is overseen by its board of governors drawn from the civil society in Kenya and Internationally. To promote Participatory rights (Procedural rights) as a tool for peace, society cohesion and climate change mitigation in natural resource extraction communities in the coastal belt of Kenya.